A very elusive title, years ago it used to be its sister volume “A Tale of Satisfied Desire”, that was the harder to find, now there are several copies of that title and none of this one. Hence the decision to procure it despite having the flaw of the previous owner having stamped it on multiple pages. As a New into the Collection title this book is not available for sale or trade. 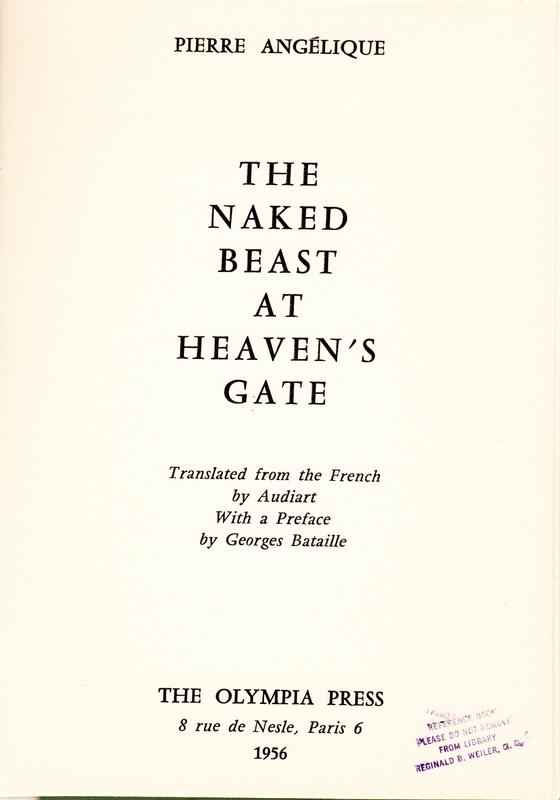 PIERRE ANGELIQUE | THE | NAKED | BEAST | AT |HEAVENS | GATE | Translated from the French | by Audiart | With a Preface | by Georges Bataille | THE OLYMPIA PRESS | 8 rue de Nesle, Paris 6 | 1956 Collation: 50 pp. No signatures. [A-F]4; the final gathering has a cancel leaf, unsigned but [F]5 and comprising pp. [49-50], attached to the recto of [F]1. 18.1 x 13.0 cm, all edges trimmed. Printed on thick, white wove paper. Contents: pp. [1-4] blank. p.  THE | NAKED | BEAST | AT | HEAVEN’S | GATEř. p.  [rule] | All rights reserved in all countries by The Olympia Press. p.  title, as above, reverse blank. p.  ―Death is the most ter- | rible thing of all; and to | maintain its works is what | requires the greatest of |all strength.‖ | HEGEL.. p.  blank. pp. 11-21 Introduction, signed by Georges Bataille. p.  blank. p.  single brief paragraph, beginning: If you are one such as knows any dread at all, read this book…ŗ, reverse blank. p.  single brief paragraph in large caps., headed: DIVINUS DEUS, reverse blank. pp. 27-45, text. p.  blank. p.  PRINTED IN FRANCE | IN JUNE 1956, BY S.I.P., | MONTREUIL, FOR | THE OLYMPIA PRESS, | 8, rue de Nesle, Paris 6 | [rule] | Dépôt légal 2e trimestre 1956. pp. [48-50] blank. Binding: Plain white wrappers trimmed flush with body of the book, under dark green dustjacket printed in black, with front cover framed by border of white, six-pointed stars. Front cover: PIERRE ANGELIQUE | [double rule in white, with thicker lower rule:] THE | NAKED BEAST | AT | HEAVEN’S GATE | [double rule in white, with thicker upper rule:] THE OLYMPIA PRESS. Spine: [reading up spine; horizontally:] THE | OLYM- | PIA | PRESS [reading vertically:] The Naked Beast at Heaven’s Gate [-] PIERRE | ANGELIQUE. 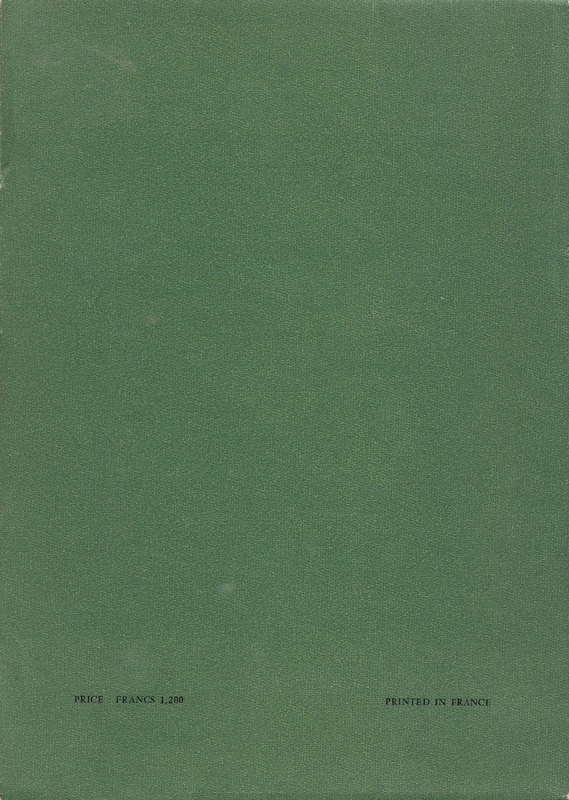 Back cover: [in caps along bottom:] PRICE: FRANCS 1,200 [-] PRINTED IN FRANCE. Notes: A translation, by Austryn Wainhouse, of Georges Bataille’s Madame Edwarda, a work first published in 1941 by Robert Godet with the false impress Editions de Solitaire, 1937. 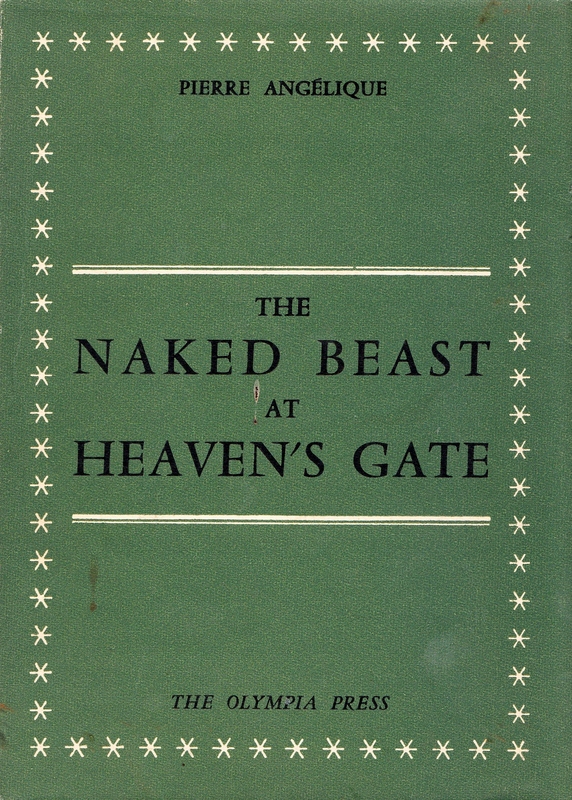 According to an Olympia Press catalogue issued in late 1955, The Naked Beast at Heaven‘s Gate was to have been published in an edition of just 500 copies, with the limitation as follows: ten copies lettered A – J (35,000 Francs). Forty copies, numbered I – XL (17,500 Francs). 450 copies, numbered 1 – 450. The ten lettered and forty numbered copies were to have been illustrated with etchings by Hans Bellmer. In a letter to the present author dated January 8th 1979, M. Girodias succinctly explained his reasons for abandoning this very limited edition in favour of the 1200 Franc trade edition, as described above: …I felt that there was no market for it. Hans Bellmerřs engravings were too sophisticated for the U.S. 6th Fleet. In letters to the present writer (dated January 11th 1976 and December 8th 1995), Mr. Wainhouse says that the choice of the English title for this work was decided by Girodias to prevent the authorities from making any connection between the English text and the French original. Mr. Wainhouse writes: Girodias did not want to call the English versions of Histoire de l‘oeil and Madame Edwarda by any title that would prompt the police, whom he thought of as blind fools, to notice their connection with the French texts. So it had to be anything but Madame Edwarda; and what Girodias and I came up with was indeed anything but. Mr. Wainhouse adds: At about the same period [as these books were published, Girodias] refused to consider publishing an English version of [Bataille’s] Le Mort. Bibliographical Detail courtesy of Patrick Kearney, The Paris Olympia Press, Liverpool University Press 2007. ← Books for Trade: .FOLLYROSES, Guy de. – Le Temple des Ivresses. Collection des Lits Clos (Losfeld) [c. 1955].